2017 was another tremendous year filled with tremendous shots. And there were so many, really, that we figured we’d enlist Ultiworld Disc Golf readers to help us decide on the season’s best. With that in mind, we are proud to present the first of four bracket challenges to close out the year. We’ve culled highlights from the sport’s best media providers and broken them down into four categories: Roller of the Year, Air Shot of the Year, Putt of the Year, and Ace of the Year. After each bracket is decided, the winners will battle in a four-way, College Football Playoff-style bracket that will determine the 2017 Shot of the Year. Before we get up for the votes, we’ve got to get down with the Rollers of the Year. Pick your favorite from each matchup below, then come back on Thursday for the next round. And if you’re having fun with this, feel free to share the love on social media. A special thanks to Jomez Productions, Central Coast Disc Golf, The SpinTV, and the Disc Golf Guy for capturing these clips. And we’re off! Roller aficionado and United States Disc Golf Champion Nate Sexton kicks off the bracket with this smash during the first Jomez Productions Basket Dash at Moraine State Park. Sure, this wasn’t during sanctioned play, but it gets our top seed for its pure monstrosity. Bonus points for Jeremy Koling’s little shuffle step as this one just. Won’t. Stop. Catrina Allen gets in on the action with this second shot roller during the first round of the Pittsburgh Flying Disc Open. She landed the eagle, then rolled to a dominant victory. Michael Johansen, meanwhile, parks hole 9 during the opening round of the Pittsburgh Flying Disc Open, where he landed in second place. It may have taken awhile for two of the game’s brightest stars to finally crack the bracket, but it was worth the wait. First, Eagle McMahon goes way up before laying down a 750-footer during the final round of the Gentlemen’s Club Challenge. Is this even fair? PDGA World Champion Ricky Wysocki answers by throwing down a cutter during his 1104-rated second round at the Aussie Open. Oh, then he bangs the putt for eagle. With Johansen and James Conrad still giving chase at the PFDO, Paul McBeth effectively sealed the deal with this Roadrunner roll that led to an easy birdie. He shot 1057 for the round and made his brother run out of the way of the shot. And McMahon closes out the festivities with another huge roller, this time at the Beaver State Fling, where he finished in third place after taking a midseason break. Did you see that exit velocity? 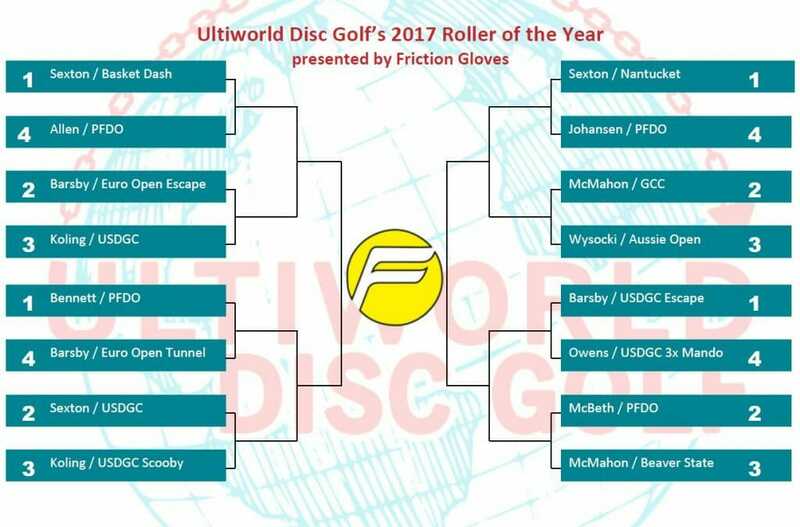 Comments on "2017 Roller Of The Year Presented By Friction Gloves"